Concrete Screws | Suitable For Concrete, Solid red brick & More | ASP Ltd.
ASP Ltd has launched a range of frame fixing screws for the installation of windows and door frames. They can also be used for installing battens. When you need to fasten any material to masonry, you should make sure that you have the correct type of screw. Concrete screws are suitable for use with a wide range of materials, including brick, natural stone, hollow blocks, and of course concrete. Our frame fixing screws can tap directly into brickwork, so you don’t need to use plugs or nylon anchors. The concrete screw is a single easy solution in place of hammer or nylon frame fixings. It provides a much faster but equally secure method for anchoring other materials to most types of masonry, or even fixing them to wood. Concrete screws are suitable for attaching timber or metal in the forms of beams, laths, facades, panels, and more. They have a variety of applications across many substrates, efficiently fixing into most masonry material from lower density perforated bricks to solid red bricks. Whatever your construction project might be, a concrete screw is the preferred fastener whenever masonry is involved. To install concrete screws, you will need to drill a pilot hole. A hammer drill is the most effective tool to do this, as standard drills will take much longer and could be damaged if you use the wrong bit. Be sure remove any dust out of the hole, because it could cause the screw to have a weaker grip strength. The required pilot hole depth will depend on the material’s hardness. In general, our concrete screws will require a pilot hole of 6.0mm to 6.5mm in diameter. Our frame fixings are all 7.5mm in diameter, and they are available with shaft lengths of 42mm up to 182mm. Self-tapping concrete screws take a lot of the stress out of fixing items to concrete, brick, or stone. The screw thread will interlock with the base material, while its tensile strength ensures durability. Once you have drilled the pilot hole, you can proceed to install the concrete screw as the fastener. 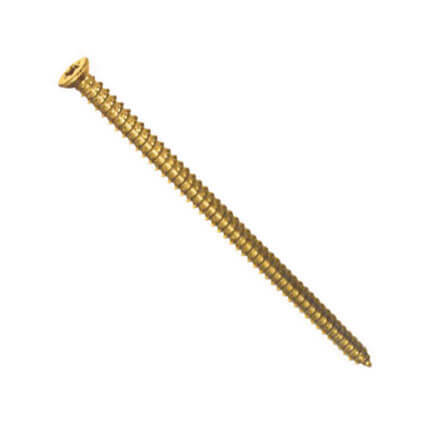 Our concrete screws have flatter heads so that the screw head can sit flush with the surface. This is ideal in situations where you will need to avoid protrusions. This also makes the overall appearance more aesthetically pleasing. However, concrete screws can also come with hex heads, which make them easier to drive. If you have any further questions about our concrete screws or would prefer to use another diameter or head style, please contact us so we can discuss options for concrete screws.